Following a senior year in college in which DeBerg passed for 2084 yards and 19 touchdowns, he was chosen by the Dallas Cowboys in the tenth round of the 1977 NFL draft. Failing to make the club, he was picked up by the San Francisco 49ers and spent a year on the taxi squad. DeBerg became the starting quarterback in ’78 and had a rough year with a poor team, completing just 45.4 percent of his passes and giving up 22 interceptions, as opposed to 8 TD passes. With Head Coach Bill Walsh’s arrival in 1979, DeBerg set NFL records in pass attempts (578) and completions (347) and threw for 3652 yards and 17 touchdowns. However, in a pattern that would be oft-repeated, he lost his starting job to Joe Montana in ’80 and was traded to the Denver Broncos in 1981, where he backed up Craig Morton for a year, saw considerable action during the strike-shortened ’82 season, and split time with prize rookie John Elway in 1983. Dealt to Tampa Bay in 1984, he had a strong year, completing 60.5 percent of his passes for 3554 yards and 19 TDs, but followed with a lesser season in ’85 and was supplanted by Steve Young, who joined the club from the USFL. DeBerg saw little action in 1986 and started the first eight games in 1987 until another highly-regarded rookie, Vinny Testaverde, was put into the lineup. He was traded to the Chiefs in 1988 and split time with Bill Kenney, passing for 2935 yards and 16 touchdowns as well as 16 interceptions. A hard worker and capable leader, DeBerg was a classic pocket passer with both a good arm and ball handling skills. Chiefs went 8-7-1 to finish second in the AFC West. DeBerg followed up with an outstanding season in 1990 in which he passed for 3444 yards and a career-high 23 touchdowns, while giving up only four interceptions, and had a 96.3 passer rating. He had one last year as a full-time starter in ’91 before he moved on to the Buccaneers for a second stint and then the Dolphins, where he was a fill-in for the injured Dan Marino in 1993. Retiring after that season, DeBerg returned as a 44-year-old backup with Atlanta in 1998 when injuries depleted the depth at quarterback, and started one game. Overall over the course of 17 active seasons with six teams, DeBerg passed for 34,241 yards and 196 TDs while giving up 204 interceptions. 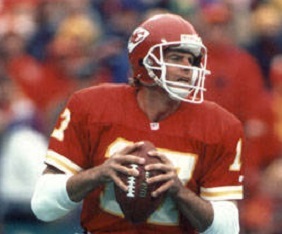 He enjoyed his greatest success with the Chiefs, where he threw for 11,873 yards and 67 TDs with 50 INTs and appeared in three playoff games.